This book features a bold main character, Jay Barton. She has no parents and is raised by her manipulative and unrighteous uncle. His family consists of his wife and daughter, who disapproves of Jay. However, that doesn’t stop her unnatural love for horse racing. 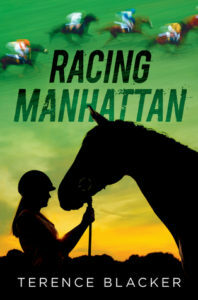 When her uncle attempts to manipulate her and conditions get worse, she runs off and finds a job in a stable, where she meets Manhattan, a tough horse that refuses to be ridden or touched, but Jay is sure that she can help the beautiful horse. Through all of it, she faces a lot of discrimination due to her gender, but she always proves them wrong. This book was amazing, it is the definition of girl power.